Public Safety and Education (PS&Ed) would like to wish you and yours a very prosperous and SAFE 2019! What better way to ring in the New Year than to signup for a course, or two, or three? Did you make a New Year resolution to be better prepared to defend yourself? Do you have a goal to carry your handgun concealed more in 2019? Do you know you need a bit more training to do so safely? Well, here is your chance! Our 2019 quarter 1 and 2 schedule is ready for your perusal and commitment. Download our schedule here / below as a PDF by course name or search our Facebook events page by date. For more information and to signup for any of our courses visit Our Website here. A Thank you with 15% Off! As a thank you to our awesome clients, we are offering 15% anything on our online store. This deal is only good until Friday the 4th at 11pm! Use code 15OFF19 at https://store.psanded.com/ to save! From our humble beginnings, five-years ago, it is amazing to believe how far we have come. We are truly blessed! In 2018 we had much growth and broke many records. Below is just a overview of what we accomplished and a look into some things already in motion for 2019. The next year is bound to be packed with even more growth and expansion. We look forward to you coming along for the ride. New Location: With a desire to offer more for PS&Ed clients, and clients always asking, Matt, along with his bride Kristy, were on the hunt for the perfect property that would fit both their needs. In May, they closed on two homes and 20+ acres of land in Lafayette, NY, and so began the expansion. Ballistics Film: Early in the year we hired on Stanly Ferris and started offering Ballistics Window Safety Film. By years end, we had installed film on hundreds of windows all over Upstate NY and Stan is already scheduled to harden windows in other states in 2019. Glass only keeps good people honest! Let us secure your home, school, or business from Active Killers or natural disasters. FFL/Gun Store: In the fall we were approved by the ATF to buy and sell guns. Our long-time volunteer Facebook admin, Erich Gressel, came on board to help with the opening and running of our brick and mortar gun store/classroom as well as our new online gun store. We were selected as the eastern distributor for Lee Armory’s banned state AK-47 rifle. As well, we quickly opened over 15 wholesale accounts giving us the ability to source almost any item you might be looking for. We also buy and sell used guns and will even consign your gun in our stores. Let Erich know how we can help you. Gunsmith Services: With our new Type 07 Manufacturing FFL we hired on Patrick Kimball, a war Veteran with a degree in firearms technology, to start offering gunsmith and manufacturing services. Upgrading, cleaning, fixing, and building guns is what Pat loves to do for our clients. Do you need any love given to your gun(s)? Social Media and The PS&Ed Show: To help drive traffic to our vast array of offerings, we focused heavier on marketing with the creation of The PS&Ed Show and Training Tuesday. Recorded in Upstate New York, Matt and Pat talk about public safety and education as a primary topic but at times delve into other topics. Nothing seems to be off the table. Their combined knowledge of firearms and self-defense marinated with witty banter and a dash of humor make for a great show. Our Facebook page broke 4,000 likes and is growing daily. We also started posting more content to our Instagram and Twitter accounts. Please consider following us on social media. If you have a topic you would like to have us discuss, want to be on The PS&Ed Show, and/or want to sponsor the show and/or our courses, please Contact Us! Pro Staff: All while the above was happening, Matt traveled the county (Camfour, SHOT Show, GAOS, NRA AM, USCCA Expo, IACP), working as pro staff for Laser Ammo, as he has for years. He also traveled to PA & NV for the USCCA to start helping usher in new Training Counselors to the ranks of their TC program. The USCCA also selected Matt to teach multiple pepper spray courses at their 2019 Concealed Carry Expo, to be held in May in Pittsburgh, PA.
Courses/Education & Events: Our course offerings continued to expand and student numbers grew. We offered over 60 different types of courses, over 175 times per year, all over the country, with many thousands of students in our seats in 2018. We brought in Larry Vickers to teach his advanced handgun course. It went over so well that we will have him back this year! We also added many new courses, some custom like our AR 101, Survival, Active Killer, and First Responder Safety (FRS) courses, and some nationally recognized like the USCCA Defensive Shooting Fundamentals (DSF) Level 1 and 2, First Aid and CPR, Countering the Mass Shooter Threat (CMST) Courses. It has been a few years since our Top Shots at OCC Charity Event and it is time to help those in need once again with our Time with TIG (John Tiegen) Charity Event. If you have watched the movie 13 Hours then come and hear first hand as to what John and his team went through in Benghazi. The Future: We started looking into the below in 2018 with plans to have them all come to fruition in the new year. Purchasing Another FFL: Near the end of the year, we were presented with an opportunity to purchase a very successful Type 07 FFL gun store and gunsmith/manufacturing company. In order to take over their client base and offer the same level of service we will be applying for our SOT (to deal in suppressors and full autos) and purchasing gunsmith/manufacturing equipment and tools. We have built the business loan and credit card free and we want it to stay that way. That said, for this acquisition, we are considering private investors that know us and our business personally and believe in what we do. If interested, please Contact Us. Meeting George Zimmerman: While in Florida at the International Association of Chiefs of Police (IACP) Conference, while working Pro Staff for Laser Ammo, Matt had arranged a dinner meeting with George Zimmerman in an effort to bring the first hand accounts of a pivotal self-defense case to the students of PS&Ed. The article is now being prepared for publication. This was the start of Matt’s delve into being a nationally recognized, published author, who is paid for their work. Matt has many more articles that he is working on submitting for both online and print publication in 2019. PS&Ed Merch: After some requests for merchandise, like shirts and hats, we started researching the possibility of offering PS&Ed branded clothing and other items such as cups and bags. We also have plans to create meme worthy shirts and to hold a contest to pick the annual PS&Ed branded Christmas sweater. Make sure to Like our Facebook page and Join our Email Newsletter so you are alerted to updates and new things from PS&Ed. Matt and Pat in the studio recording the pilot of the very first PS&Ed Show. We just finished uploading the pilot of our very first internet based show! Visit our MEDIA PAGE to get more info, watch it, and then give us your feedback here. The show will focus on the topics of public safety and education though the format will be fairly light. We do however have topics or bullets, if you will, that we want to cover on each show. Let us know if you have kudos, suggestions or even complaints. We can only get better with an honest review and our goal is to provide you with a solid product! We are looking for guests to come on the show in person or via phone/Skype. We are also open to select sponsors interested in helping the show-to-go-on along with giving their cause/business exposure. If any of this interests you, please contact us. Thank you for your support! We truly appreciate it. Shoot straight and stay safe! Leading up to our AR Carbine 101 Course we keep getting asked “How should my rifle be setup for the course?”. Well, Patrick Kimball, one of our Instructors put this article together to answer just those questions. When choosing a new carbine setup, the first question you must ask is whether to build a rifle or buy it. For the purposes of this article, I will assume that most of us are going to buy our guns as opposed to building them. I will also operate on the premise that the rifle chosen has a chamber dimension of either 5.56 NATO or .223 Wylde as these are the most popular at this time. Some general thoughts on building will follow at the end. When buying a rifle specifically for defensive use, reliability should be of the utmost concern. If the tool doesn’t work when we need it most, it most certainly isn’t worthy of being trusted to save lives. The reliability of the rifle is dependent on proper construction, quality components, running good ammo, and proper lubrication/maintenance. It’s important to buy a rifle from a manufacturer that is known for proper QC (quality control) standards. There are many lower end rifles out there that are perfectly fine for range use, but just not built well enough to be a dedicated defensive carbine. I recommend starting around the Smith and Wesson M&P Sport 2, Windham Weaponry, or Bravo Company, in the AR price spectrum. Even manufacturers of quality guns sometime have QC failures, so it’s important to know how to spot potential issues like a poorly staked gas key. A 14.5” barrel with a pinned and welded muzzle device or a 16” barrel is a must-have on a defensive gun. Any longer and maneuverability and fast handling, in confined spaces, will be compromised to some degree. Speaking of maneuverability, a carbine length buffer tube and adjustable stock are best for a compact, quick-handling gun. Spend money on a quality gun with a barrel made from materials like 11595E, 4150, or at a minimum 4140 chromoly steel. Another area of special importance is the bolt carrier group. A good bolt carrier group will have an aggressively staked gas key and have a magnetic particle inspection (MPI) done by the manufacturer. Make sure to buy your gun from a manufacturer that indicates their products are properly tested to military specifications. These tests include magnetic particle inspection to look for weak points and micro fractures, and high pressure testing to ensure the bolt can withstand the increased pressure of a round loaded with a hot powder charge. A defensive rifle must have a white light on it, end of discussion. As well, everyone should carry at least one flashlight on their person. Most critical threat incidents happen in hours of low light. Positive identification of a potential target is critical; if you are going to point a rifle at something you had best know what it is before you decide to shoot it. A 200 lumens light seems to be the minimum acceptable standard in most circles, but be careful of a light that is too bright as it may wash out the target or worse yet, temporarily blind the user. Just like a good light, every serious use rifle must have a sling on it. Your sling should make it easy to manipulate the rifle from either side and for this reason, 3-point configurations are outdated. Single point slings are fast-handling but lacking in control of the gun when not in use. A quality two-point sling is the most common and viable option. Find a sling that aids in security and weapon retention, is quickly adjustable, and allows the user to operate on either side of the gun. Red dots and holographic sights are very popular on defensive carbines, as are low power variables like 1-4x or 1-6x. Any optic that depends on battery power must be backed up by some sort of iron sights. Batteries die, and it’s generally at the most inopportune moment. Optics with glass etched reticles are somewhat more resistant to failure, but iron sights are still something to consider. Ambidextrous controls are all the rage right now, to the point that they are standard equipment on some guns and aftermarket parts like ambi mag releases, which fly off the shelves. In reality while these amenities are nice to have on your gun, they don’t really make you a better shooter. The AR platform is actually fairly easy to use as left-handed shooter, provided you put the work in to learn the skills involved. The lone exception is the charging handle; the mil-spec charging handle is inadequate and should be replaced by something with a more practical, easy to use latch. There are many quality ambi charging handles on the market, just beware of foreign knockoffs made with inferior pins and metals. Magazines are the weak link in the chain for nearly all semi-autos, so invest in quality magazines. There are many excellent polymer mags out there, and most are relatively inexpensive relative to their quality. Do your research and find a reputable brand known for reliability. GI mags are also fine, provided they have the enhanced tan or black followers. Those with the old green followers are known to tilt, causing failure to feed. Be sure to get rid of any magazines that don’t drop free when you depress the mag release, or at least restrict them to range use. A few notes for the builders out there. Spend the money for a quality barrel and bolt, they are the heart and soul of your gun. A barrel that is dimpled for your gas block set screws will help ensure that your gas system is securely in place, as will knurled head set screws. Steel gas blocks are much more durable than aluminum, but whatever gas block you buy make sure to install it properly in accordance with manufacturer specifications. Inspect the staking on your gas key, make sure that there is an aggressive stake job to keep the bolts from backing out over time. Properly torqued grade 8 bolts should have no problems, but better safe than sorry. If you build your own lower from a parts kit, be sure to stake the end plate to secure the castle nut. Some use LocTite in place of staking, the thought process being that the threads will be secured and can be loosened easily with a heat gun. You will get no argument from me. Make sure to follow torque recommendations and apply appropriate thread treatments, if you pay attention to the details the result will be a very reliable rifle. As far as general preferences go, I like mid-length gas systems for soft recoil. I run an steel adjustable gas block, 16” barrel with a melonite finish, 1/7” twist and M4 feed ramps. I don’t use ambi controls, but I do use a short throw selector that is great for using from the support side. I have an H2 buffer. My gun has a two-point sling, a prism scope with glass-etched reticle, and a light with a push button switch. It is very usable from either side and it works for me, just like your defensive rifle should work for you. Patrick Kimball is an former Army Sergeant and decorated war veteran, Sig Sauer, NRA, and USCCA Instructor. Pat along with PS&Ed founder Matt Mallory offer an AR Carbine 101 Course. Make sure to also take a look at the rifle courses we have scheduled with Larry Vickers in 2019! Did you catch Matthew?’s article http://psanded.com/no-guns-allowed-signs/ about no guns signs in NY? As always, we want to hear from you about companies impeding on your second Amendment RIGHT to bear arms! From 1882-1891 Russia designed the bolt-action, five-round, internal-magazine fed, Mosin Nagant military rifle. It is a well known long-gun, not just due to the fact that over 37 million were produced, but also because it is sought after by collectors and enthusiasts. It is very effective with its 7.62×54R round, and much like the AK-47 and its variants it is durable, easy to use, and inexpensive. However, not as inexpensive as back in the day when you could shell out a single $100 bill for one. Now-a-days you can get a Mosin at Cabela’s for around $250. Other places have them listed for more depending on the vintage and series. But, I digress, you didn’t come here for a history lesson, so lets press on. In January of 2013 the New York SAFE Act, or as we NY residents like to call it – the UnSAFE Act became law in the middle of the night. Just prior to the Governor cramming this hideous law down our throats, a good friend of mine, Brennon, purchased a case of six of these fine historical rifles. With no room in his safes a few of them shared some space with my family of long-guns. One eventually ended up going to his brother but I made sure that two were earmarked for me! A long time later after some greenbacks changed hands and bartering was done. Bartering in the form of painting his hunting lodge, him attending my Utah multi-state course, and then finally the guns, including the bayonets, were officially mine. With matching numbers on the bolt and receiver, I was excited to add the 1939 and 1940 Tula manufactured M91/30 rifles to my collection. Originally I had the desire to turn one into a period sniper rifle with a PU scope and the other into a current day sniper rifle with an Archangel stock. Over the years, I picked up a couple items I was missing, for the 1940 rifle to be restored to period. I was able to fairly easily find a sling and cleaning kit at the local gun shows. However, an original PU scope proved to be impossible to find at the shows. So to the internet I went. To my amazement a search for these scopes showed that it cost almost as much if not more than the rifle itself! Even the reproductions were costly. So not wanting to spend that much on the scope plus the cost to mount it and have the bolt bent, I put the whole thing on the back burner for the time being. In all of the years I had these relics in my possession, I had not taken them out to the range but a handful of times. However, after this project is complete they will surely see the light of day quite a bit more often. At least my new aged sporterized Mosin will. Recently, we used one of them to blow up some Tannerite, as you can see in the below video. It was a fun day at the range. Just like that, the project was brought to the front burner, once again. While staffing the Laser Ammo booth at the I/ITSEC trade show in Orlando, Florida last month, my project got injected with a blast of energy. I met a guy, who knows a guy. Man that sounded cliché. Anyways, Keith Avery stopped by the booth and we got talking about guns, and he had to tell me about the Mosin build that he just finished. He was excited to share his story with me and I was so glad that he did! Keith’s enthusiasm and photo of his completed work of art, shown below, inspired me to revive my build and write about the process via this two-part article. Keith referred me to Rock Solid Industries, who referred me to Coyote Creek Armory, who then referred me to Black Dove Customs. The collaboration, on this build, between the three companies has been a blessing and helped everything fall into place. After careful thought and input from Ken at Rock Solid, I decided not to turn the 1940 Mosin into something it was not. Though there were original Mosin Nagant sniper rifles built, the specific one that I have was not one of them. The original sniper rifles came with a bent bolt so not to interfere with the PU scope. It all came-down-to not wanting to cut the bolts off both of my Mosin’s. One of them yes, but both of them, well I just couldn’t do it! So I decided to simply restore the 1940 to its original glory and turn the 1939 into a current day sniper rifle. Though it took me years to get to this stage, with the help of the many people and companies listed below, this project will be done in a matter of months. Once completed I will be taking a trip to my good friend, and Top Shot, Keith Gibson’s farm (check out his family business here) to do some long range shooting with my new sporterized Mosin Nagant sniper rifle. To read the final steps of this journey, along with all the products and services each of the above people and companies played in this build; see pictures of both completed rifles, and watch a video of Keith and I putting the new sporterized rifle through its paces, make sure to join our newsletter and like our Facbook page. Watch for my follow-up article to this one titled “My Two Mosin Nagant Builds [Part 2 of 2]”. If you enjoyed this article please like it on Facebook and share it with others. Is a TASER or Stun Gun legal? Back in March the U.S Supreme Court wiped out a Massachusetts court ruling that had upheld the conviction of a Massachusetts woman, arrested in 2011, for having a stun gun which she said was for protection against her former abusive boyfriend. Many people confuse TASER and Stun Gun. Just to clear things up, let me bore you for a moment. TASER is a company that makes devices that fall under the category CEW (Conducted Energy Weapons) or CED (Conducted Energy Devices). Upon firing, a TASER shoots two metal probe darts at a distance of 15-35 feet. The TASER can also be used as a direct contact stun gun. Though, a stun gun is not a TASER, as it does not project any darts, and you must make contact with the assailant for the device to work. Either way, they both hurt like hell! Now back to our topic. SCOTUS ruled that the Second Amendment applies “to all instruments that constitute bearable arms,” even those not in existence at the time of the founding. Though it came close to doing so, the ruling did not categorically declare bans on stun guns unconstitutional. This is the law that is still on the books! Just like in my article “How many rounds, 7 or 10?” A Judge or Court ruling does not change the law. Technically it is still law until the law is amended. Until then, my suggestion would be to take our course on pepper spray and carry that for a less-than-lethal option. Now don’t laugh too hard when you watch me get tased in the below video! How many rounds, 7 or 10? New York residents ask me all the time, “Can I once again carry 10 rounds in my magazine?” As a law enforcement officer and certified instructor for the state my answer is, it’s complicated! As many people know, the New York SAFE Act made it illegal to have more than seven rounds in your semi-automatic handgun magazine. The law required you to get rid of the magazine or have it permanently modified to only hold seven-rounds. Though you could still have one in the chamber, IE: 7+1, and you could carry as many magazines as you like, this law did nothing to stop criminals from loading 10 or more rounds into their magazines before going to rob a bank! Just after the un-SAFE Act’s passage I met with both State Assemblyman Sam Roberts and State Senator David Valesky to discuss the MANY issues with the new law. In short, one of them said that they voted the way Governor Cuomo told them to. I reminded them that they work for us, NOT the Governor and assured them that they would never get my vote! Anyways, back on topic. Right from the start firearms manufacturers one-after-another stopped shipping products to NY, others stated they would not make seven round magazines just for the state, and the worst thing was that some started pulling their businesses out of the state. With all of the push back, the Governor decided to allow us humble servants to keep our 10-round magazines as is, but we can only legally load 10-rounds into said magazine when at the range or a competition. How absurd you say? Well I agree! Now it gets interesting. In late 2013 Chief U.S. District Judge William M. Skretny in Erie County, struck down the component that had made it illegal for individuals to load more than seven-rounds of ammunition into a magazine capable of holding 10-rounds. So Western NY was back to 10-rounds while Eastern NY was still at seven. Then the 2nd Circuit of the United States Court of Appeals upheld the lower-courts ruling! A small win, but a win nonetheless. Unfortunately, that is not the final straw! A Judge or Court ruling does not change the law. Technically it is still law until the law is amended. In an effort to see where the State of New York stands on this matter I contacted the SAFE Act phone number at 518-474-8390, which I got off their website https://safeact.ny.gov. I was told to contact the State Attorney General’s office. So I sent an email to the AG’s office through their website and waited. Some many weeks later I received a letter in the mail, yes physical mail, directing me to contact the New York State Troopers to get my questions answered. Now mind you, the Troopers are the ones running the SAFE Act website who told me to contact the AG! I promptly called my local barracks who suggested I call their legal council. I asked the trooper for a phone number and he said to just Google it. Well Google is normally helpful, but it was not in this case. I decided to call the Troopers Pistol Permit Bureau. I left a message and got a call back the same day, and finally received an answer! The State Troopers have been given a directive not to charge anyone with breaking the law for having 8-10 rounds in their magazine. However, that does not mean other law enforcement agencies in the state won’t arrest you, because they can, and the District Attorney won’t bring charges against you, because they can! A Judge MIGHT throw the case out, but who in-their-right-mind would want to take the chance and possibly have to spend time in jail, court, and spend their hard-earned money defending themselves? It is still a law in the books, and until that changes, my advice is to only keep seven-rounds in your magazines, unless you are at the range! Just make sure you have multiple seven-round magazines on you and learn how to correctly and efficiently do combat/tactical reloads. This way you have a fighting chance and possibly more ammo on hand than the bad guys do! So I went with my wife to see the movie Independence Day at the new Movie Tavern in Camillus, NY and there it was, a no firearms allowed sign! Funny how we went to see a movie about our Country’s Independence yet they don’t allow the tool that helped us to win our independence on their property. In New York State, these type of signs have no legal ground UNLESS it is a location owned/run by the government such as the post office, court house, etc. If it is at a private business the business owner is trying to scare you into thinking it does carry weight. Don’t forget that if they find out your carrying, and they ask you to leave and you don’t leave, they can have you arrested for trespassing! If that happens the judge can and most likely will revoke your pistol permit. From what I hear, there are other businesses that are anti 2nd Amendment such as Buffalo Wild Wings, Target, Walgreens, and Denny’s. If you decided to do business with places like these, which I suggest you don’t, and you decide to carry, you need to make sure to conceal it well, like the law requires. You also shouldn’t tell stories about the gun that you have on you while you are there! Better yet, not talking about evil guns, hunting or anything at all that might offend a liberal is probably wise. Now, what’s to say they call the cops to ask you to leave the property because hey you have a gun and they obviously think guns are scary and kill people all on their lonesome. Then if the person who called the police says that they told you to leave already well that might not end well if the officer believes the business! Personally I like to quietly ask the employee if it is okay to talk. The employee will look at you weird and think what kind of question is that. Then I say, since you don’t want us to exercise our Second Amendment right to bear arms, I figured you did not want us to exercise our First Amendment right to the freedom of speech! I then give them one of the cards above, that I created, and walk out! If you would like some of our “No Guns – No Business” cards just swing by any of our scheduled courses and grab a stack. If you see any no guns signs out there in your travels send us a photo or post it on our Facebook Page. Let’s keep everyone informed! 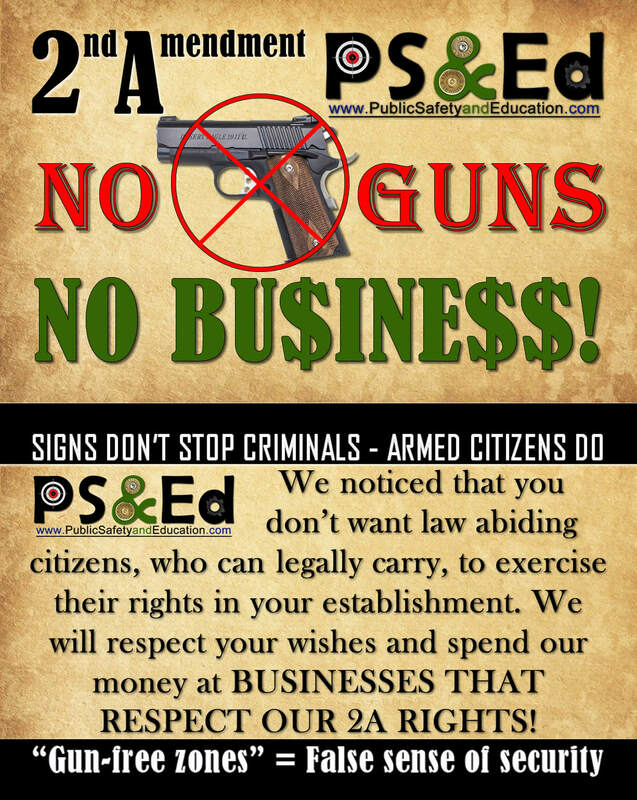 My advice is to not do business with businesses that post “no guns allowed” signs. Better to stay out of the gun fight all-together than be judged by 12 or carried by 6. Thank you for your business and support! We at PS&Ed want to wish you and yours a very Merry Christmas and prosperous New Year! Please like us on Facebook to keep up with changes in the firearms industry as well as what new training we roll out. Speaking of that, we thought you might be interested in the below courses that we have coming up in the new year. Please forward this email and help us to spread the word! We look forward to seeing you on the range and in the classroom. Are you still not sure what to get that special someone? Why not give them a Gift Certificate or chose one of the courses below! Don’t forget that we offer private courses at your location as well as private shooting lessons and we are resellers for Laser Ammo and Frog Lube! All great Christmas gifts!